Viewed from the south-east. Beneath the steam engine and wagons at the lower right of the picture are the words 'Great Northern Railway near Terminus Belfast'. Behind the tall chimney is the Distillery Football Club. Its sign reads 'Distillery Footba', with the 'll' hidden behind a building. 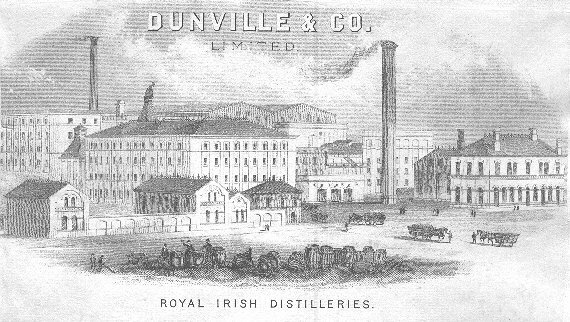 This painting and the other paintings below are from a poster advertising Dunville & Co. Ltd.
Viewed from the north-east, where they are approached from Distillery Street. The four-storey building with three hipped-end roofs, left of centre, and the chimney on the right, are also visible in the painting above. Viewed from the south-east. The entrance in the centre faces Distillery Street, to the right. The Distillery Football Club is to the left of the large warehouse with six gables in the centre. The four-storey building with hipped-end roofs at the lower left of the painting is also visible in the painting and the engraving above. However several changes appear to have been made to other buildings between the dates of the engraving and the painting. Old map of Belfast showing the Royal Irish Distilleries to the left of the centre, the Distillery Football Club Ground to the north of it and Dunville Park at the top left. The U-shaped building in the painting above is visible on the map at the north-east corner of the Royal Irish Distilleries. However the large warehouse with six gables in the centre of the painting appears to have been placed on the location of the Football Ground on the map. 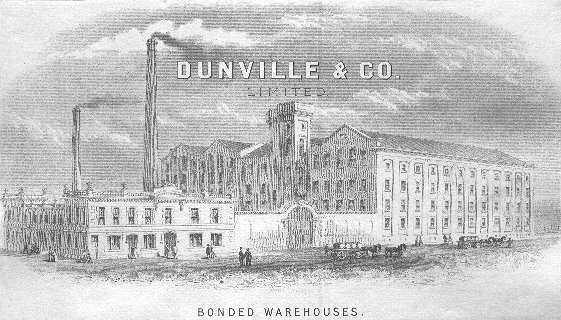 This is the only building once used by Dunville & Co. Ltd. that still exists. The offices in Arthur Street were built in 1906. The picture would therefore have been painted in or after 1906.